Goblin Chainwhirler has a lot going on. The first thing I notice is the RRR casting cost, limiting it almost exclusively to mono-red goblins and burn. 3 power and First Strike is solid to boot. The point of discussion of course is Goblin Chainwhirler’s ETB ability. I’m a bit surprised that a Goblin card doesn’t damage your own creatures as well, but gameplay always trumps flavor. 1 damage is… underwhelming. Unless you are faced by a hoard of Saprolings, not a whole lot of creatures are going to die. Soul-Scar Mage or a well timed The Flame of Keld make the damage hurt a bit more. This card gets a bit more value in multiplayer. Unfortunately due to the casting cost it is hard to splash in flicker cards to abuse this card’s ability. I suppose Kiki-Jiki, Mirror Breaker is a good solution to this problem. Whirl a chain, ruin a day, or something. 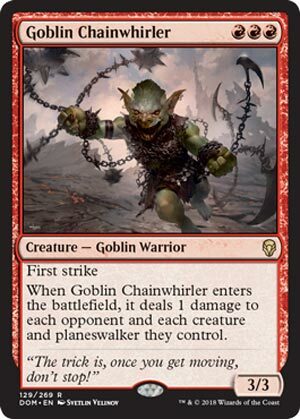 Goblin Chainwhirler has already proven to be one of the hyped-up Dominaria cards, even in spite of its mana cost. Because, lo and behold, it has a shell it fits flawlessly into, the Red Deck Wins of Standard. Chainwhirler is several things: a small board wipe on any X/1 creatures, a bit of incidental damage to planeswalkers (and players), and a nasty body. A 3/3 with first strike is deceptively hard to get through, especially on curve, and red is helped by all of its various combat tricks (which see sporadic play, but they are there!). It’s not too hard to use the Chainwhirler to clear the board, and then blast things with it. It also plays well with the likes of Goblin Warchief, even if the triple-red mana cost isn’t reduced in any way. It may look underwhelming, but it performs quite well as a result of the surfeit of X/1 creatures (or go-wide token strategies), and Goblin Chainwhirler will have a home as long as there’s a red deck to be had.